Today I got to spend a few hours painting. I’m not a painter by trade, so for me, I can enjoy it and not touch it again for several years. One of the things I like about painting alone is it’s easy to think and process, even as I listen to some good music. Matthew West came on a few minutes later “So I wait for the moment when you come for me…and I can’t stop thinking, just a few more days I’ll be going home, just a few more hours and I’ll be flying, it could be any minute now that you take me away, or maybe just a few more days. To You a day is like a thousand years, and only you know when the clouds will clear. So let me not forget. I miss Zac. But his life and death remind me how short our time on planet earth is until Jesus either takes us home or comes to get us. Really, just a few days. What we do each and everyday matters as we follow the Lord and bring honor to Him by telling others of His great and amazing love and grace. Thank you dear God, for Zac and for today and for the joy of living a life that is granted by You. Now I’ll go have some French Silk pie, for Zac. I just watched NewSpring church online. In an attempt to answer the age-old question of ‘why does God allow bad things to happen to good people’, last week and this, Perry is leading his church to understand how God works in the pain. I was honestly blessed by watching some video stories of people who have gone through great pain and tragedy and are finding God’s faithfulness leading to triumph. As stated, it’s not all nice and pretty, nor is it all done and wrapped up in a bow. When we endure hard things, the pain is real and lasting. The Lord has brought several instances across my screen lately to remind me, and probably to prepare me for the pain He allows to make us more like Him and to bring Him glory! Especially awesome was watching as Mandy picks up the story after Zac went to be with Jesus. As expected, NewSpring did an excellent job of the video. It’s on this evening, well, actually in about 5 minutes, but also tomorrow (Sunday) at http://www.newspring.cc/live/ or it’ll be on their website later this week too. God is still God and God is still good. To God be the glory! 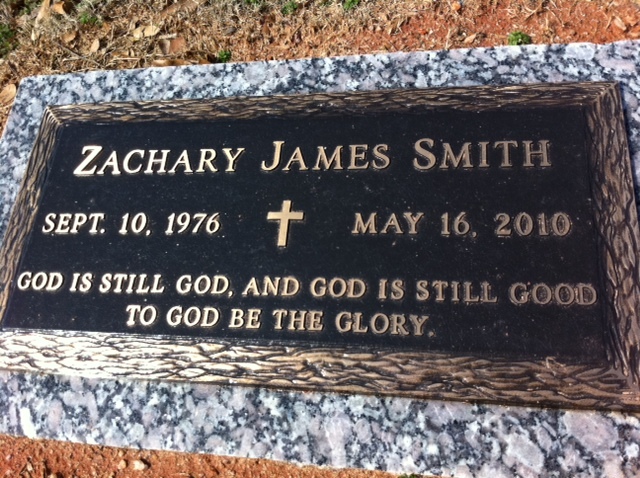 Exactly 34 years ago today, on Friday, September 10, 1976, at 1 p.m., Zachary James Smith arrived in Denver, Colorado. He was in a hurry to get here. He was born two months early and weighed in at 4 lbs., 3 oz. Before he lived very long, his weight dipped below 4 lbs. Kind of a scrawny little guy, he was taken by ambulance from the hospital where he was born to the Children’s Hospital in Denver where he lived for many days in NICU. His heart and lungs were not fully developed. He had no sucking reflex. He was weighed every night at midnight. We would stay up and wait until 12:05 so we could call the nurses and see if had gained any weight. His beginning was somewhat frightening to his dear mother. I think I was scared, too. But my memory works differently than hers and what I remember most was the overwhelming weight of responsibility. I had married an amazingly beautiful wife at a young age and now, all of a sudden, I was a father. We went from two rather small salaries to the smaller of the two. The 30 days in the hospital finally came to an end and young Zachary came home to our little house on Kansas Drive. By now, he was in a hurry again. He was quick to develop and catch up with the growth charts and the statistics. We could tell from very early on that his mind was advanced. He had inherited some stubbornness and some IQ from his grandfathers. That turned out to be a really good thing. That first Christmas, he wore a newborn Santa outfit and we bought a long-play record of John Denver’s Christmas songs. Among them was A Baby Just Like You. This was a song Mr. Denver sang to his son, Zachary. Merry Christmas, little Zachary. That turned out to be a long-standing tradition. He was in a hurry to exit, as well; wasn’t he? He has left his parents and sister and wife a heartful of memories. He has left his amazing children an incredible legacy. Join me in thanking God today for Zac’s life.